Hey y’all! It’s the holiday season and that means fun gatherings, gift exchanges and even cookie swaps. I never need an occasion to eat a cookie, but now is the perfect time to try new recipes for family and friends. 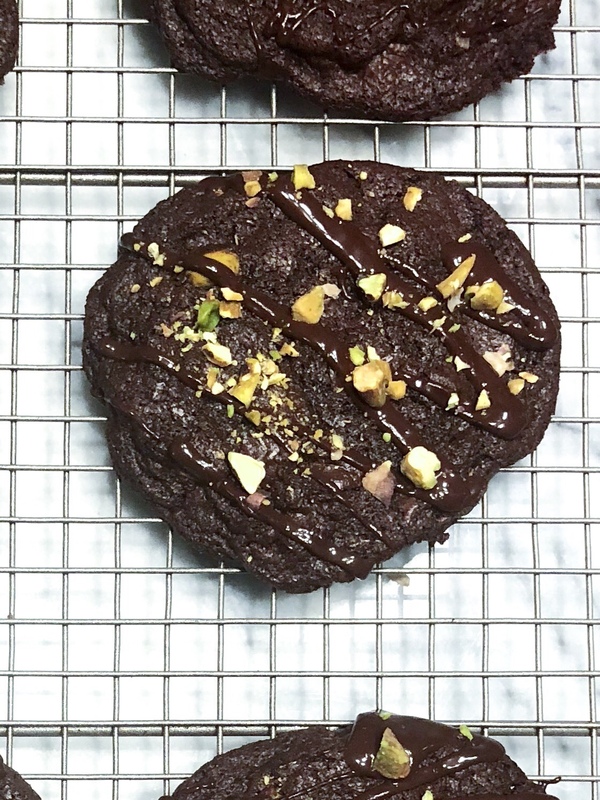 These cookies have double chocolate, (can you ever go wrong with chocolate?) and salted pistachios which is the perfect combination. These cookies are also made with real butter, real sugar and they have gluten. And guess what? We will survive! It’s OK! Promise! Remember, we can have a regular cookie and not feel guilty about it. We shouldn’t! As I always say, we can find something good in everything we eat. The good in these? Cocoa can potentially reduce the risk of cardiovascular disease and lower blood pressure. Other ways to use cocoa include in oatmeal, cocoa roasted almonds as a snack or in a morning smoothie. Pistachios contain protein and fiber which promote satiety. The takeaway is to enjoy this season and time with family friends. Eat that cookie, or pie, or loaded mashed potatoes or salad and relax. I hope y’all enjoy this recipe and Happy Holidays! Preheat oven to 350. In large bowl, combine melted butter, sugar and cocoa powder until smooth. Mix in egg and vanilla extract. In separate bowl, sift together flour, baking soda and salt. Add dry ingredients to stand mixer and combine until incorporated. Fold in dark chocolate chips and salted pistachios. Chill mixture for 30 minutes. Using a 3-4 oz scoop, place cookies on lined baking sheet. Press rounds down slightly to flatten them and bake for 14-17 minutes. Ummm. This sounds so good. Thanks for the tips about incorporating cocoa more. Never would have thought about adding it to my breakfast smoothies. No problem! I’m glad to help!